I didn’t get a chance to go out beforehand to take any test shots the night before. I was just wrapping up teaching a photo workshop on Perfect Photo Suite 8 from onOne Software the weekend prior to the eclipse and had initially thought the eclipse was going to be Tuesday evening – not the Monday evening/Tuesday morning it was set for. Had the eclipse happened Tuesday evening I would have gone out Monday evening to scout. But even with no prior scouting I still knew the photographs I needed to take to produce the image I was going to create. I decided I was going to first take a wide angle photograph of the landscape, then take numerous photos of the moon at different stages with a telephoto lens. I would then combine them in Perfect Photo Suite 8 to create a composite photograph that visually represented what occurred naturally, but with an artistic spin. Earlier during the day of the eclipse I researched various websites to determine the exact timing of the different stages of the eclipse. The website that gave me the most info on that was MrEclipse.com. I also came across the website of photographer Sean Bagshaw who created a wonderful composite photograph of the 2010 lunar eclipse and gave a nice writeup on how he photographed it. It was great reading as his photo was very similar in technique to the one I had earlier envisioned creating. I knew the shot I was after and knew the times of the different stages of the eclipse. The only thing left to do was wait for the evening to come and then get to work. According to MrEclipse.com the partial eclipse was to begin at 10:58pm. 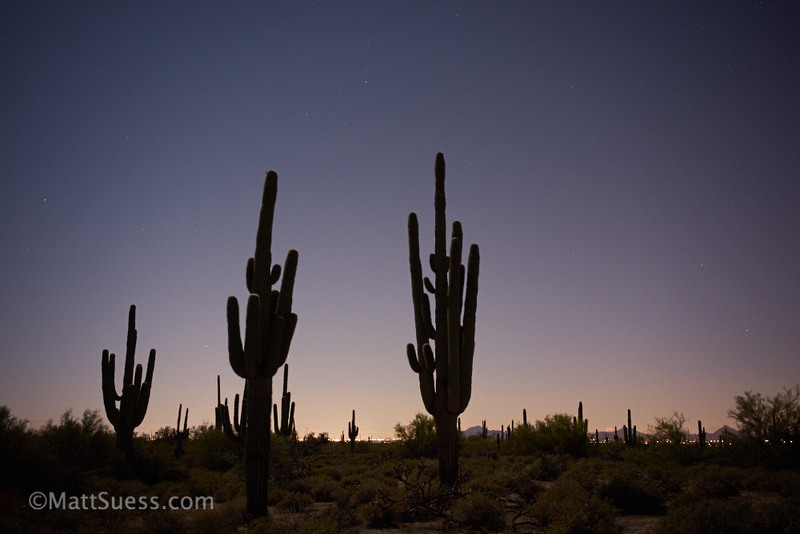 Shortly after 10:00pm I left my RV and walked out into the desert to photograph my saguaro scene under the moonlight. Being very familiar with this area I had an idea of where I wanted to photograph from already, and it took just a few minutes to settle on a composition. Being just a half hour before the eclipse was to begin I was able to see where in the sky the moon currently was and guess the direction it was going in. It was fairly high in the southeastern sky and was going to travel west. I knew the moonlight would help lighten up the desert floor when I photographed, but I had to take care in the direction I faced the camera. I didn’t want to photograph the desert scene with the moon to my back. I already had pre-determined I would add the moon over my cactus photo, so that meant I had to face south while taking the photo to keep any lighting and shadows on the ground realistic. In fact if you look closely at my finished photo, you can see some rim-light from the moon on the left edge of the saguaros. This is how the saguaro photograph looked straight from the camera with absolutely no adjustments yet to the RAW file. Doesn’t look like much, but I had all the info I needed in this RAW file to adjust the exposure and color. I also knew that by photographing towards the south I would have the added benefit of picking up light pollution from the Phoenix Valley. That light pollution is what gave me the “sunset” glow on the horizon and provided great separation of the cactus from the background. Only 7 photos of the cactus scene were taken on my Sony a7 camera with the Sony FE 35mm f2.8 lens. Using the LCD screen and histogram I was able to confirm composition, exposure and sharpness out in the field and knew right away I had what I needed. The photo I used was photographed 20 minutes prior to the start of the eclipse. It was a 15 second exposure at f4.5 at ISO 400. Once I knew I had what I needed I walked back to my RV and swapped the 35mm lens for a 70-200mm Canon lens with the Metabones III adapter. I sat down on a nearby picnic bench, placed the camera on a tripod, got my new 15″ Macbook Pro laptop ready, and started taking photos of the moon at 200mm at 10:35pm – just 10 minutes before the eclipse began. This gave me enough time to take a couple test shots, load them on the laptop to verify exposure and sharpness, and get ready for the next 4 hours of continuous shooting. I decided beforehand that I wanted to take a photo every 5 minutes or so of the entire eclipse. My initial planning called for having up to 21 different moon photos in my final composition, and photographing every 5 minutes would give me enough material to work from. The zebra patterning of the Sony a7 was excellent at showing me when I was in danger of blowing out my highlights, allowing for an easy time figuring out exposure settings. The light was continually getting darker from the very start of the eclipse and I was constantly adjusting my exposure for it. And of course, once the eclipse peaked the light was continually getting brighter until the full moon was present once again at 2:45am. Here is a full-frame shot of the blood moon at it’s peak. This file is seen after it had been processed in RAW software from Capture One Pro. Even at 200mm the moon doesn’t fill up much on a full-frame camera like the Sony a7. My exposure settings for the moon started out at 1/500s at f5.6 at ISO 100. 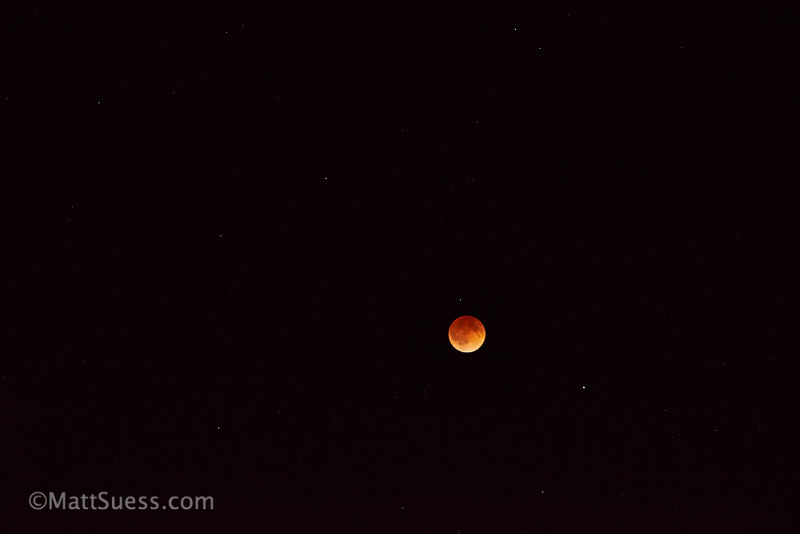 When the moon was blood red it was at it’s darkest and my settings then were at 0.8s at f5.6 at ISO 320. The moon was underexposed by almost 2 stops at that point, but I did not want to shoot higher than ISO 320 or longer than 1 second if I could help it. I didn’t want extra noise and I didn’t want motion blur from the moon with longer exposures. Having the laptop with me while shooting went a long way towards making sure I was getting a good working exposure and sharp moon and eliminated the need for me to bracket. I never set up a timer to keep track of my 5 minute intervals but had an eye on the clock and was able to take a photo every 4-6 minutes. The early “rough draft” I was working on in Perfect Photo Suite 8 while the eclipse was happening. 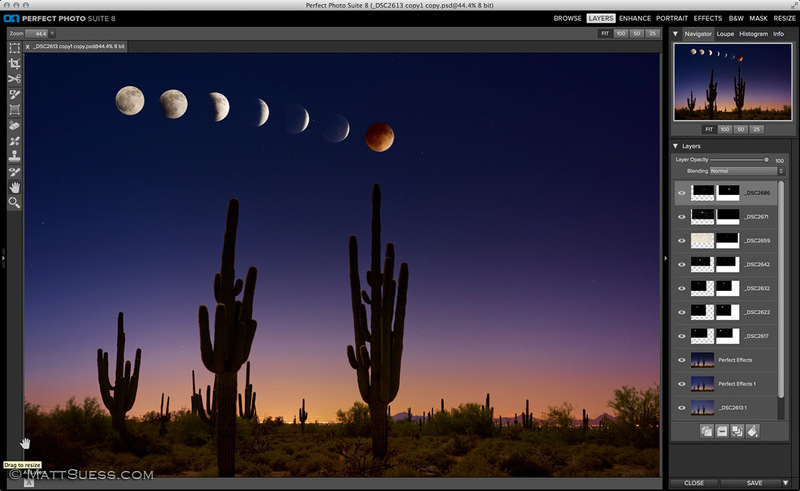 During the course of the 4 hours of the eclipse I was already at work on my computer between the 5 minute intervals enhancing the cactus photograph first in Capture One Pro, then in Perfect Photo Suite 8. I was also beginning to do a “rough draft” so to speak laying out my final photograph and testing placement of the moons. And at the same time I was spot checking the moon shots I was currently photographing by taking the card out of the camera and checking things out on the computer. Finally at 2:45am I took my last moon photograph. It was the 118th photo of the moon I took that evening. Next up was 5 hours of sleep before I continued the task of building my composition and final image. Part 2 of this report is now online here and covers how I processed and enhanced my final image. .
Any questions? Feel free to ask in the comments section! Such a great idea to bring a laptop! Can’t wait to try this composite technique!